This objective is focused on the VMs rather than the hosts but there’s still a large overlap between this objective and the previous one. 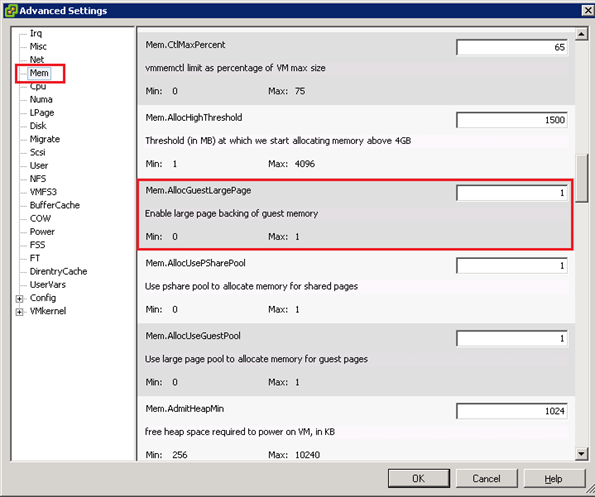 Disable unnecessary devices in the VM settings (floppy drive, USB controllers, extra NICs etc) as they have a memory overhead. Read VMware vSphere™ : The CPU Scheduler in VMware® ESX™ 4.1 and Frank Denneman’s blogpost to understand the theory. NUMA architectures (see section 3.1.9 for full details). Don’t allocate a VM more vCPUs than per NUMA node. A VM with CPU affinity set cannot be vMotioned, hence it can’t be configured for a VM in a fully automated DRS cluster either. Enabled per VM and needs a reboot to take effect (ironically!). Not compatible with Fault Tolerance – use one of the other. Check the reservations and limits set for the resource pool. Is it unlimited (the default) and expandable? One of the most common support issues is troubleshooting why a particular VM can’t be powered on, typically with the error that it failed admission control. Check resource pool settings! Check shares for the VM – if it’s in a cluster you can check it’s ‘worst case allocation’ on the Resource tab. NOTE: One common misconfiguration is to have VMs in the root resource pool. This can completely skew the resource allocation because it’ll get a percentage of the root resource pool. NOTE: Shares are relative to other VMs on the same host and only apply when there’s contention. Food for thought from Duncan Epping. NOTE: When admission control checks available memory (to guarantee to a VM as it’s being powered on) it uses ‘machine memory’ rather than ‘guest physical memory’. This means TPS savings are factored into admission control. Explained by Frank Denneman. fixed reservations – the child resource pool has a fixed limit and attempt to allocate more resources will be denied. Some good thoughts in this VMware communities thread by Jase McCarty and another Frank Denneman post. Swap is almost certainly BAD! NOTE: Some applications will grab as much memory as they can (or are configured to) and manage it themselves rather than leaving it to the guest OS – Java and Oracle are typical examples. Unfortunately this makes tuning the VM difficult as neither VMware or the guest OS know what memory is in use (and therefore can be paged/ballooned). Check using esxtop that a vSMP server is equally balancing CPU across the vCPUs – otherwise it maybe misconfigured or simply not using multithreaded apps (in which case you could consider decreasing vCPU allocation). Consider HAL when doing this. VMware recommend that when hardware memory virtualisation is enabled you also enable large page support in the guest OS (ESX is enabled by default). Some estimates show a 10-20% performance increase for large memory pages – more in the VMware white paper on large page performance. If you want to know more check this good blogpost on large memory pages by Forbes Guthrie and follow his links for some interesting discussion. 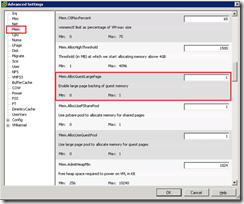 vSphere automatically enables large pages but you can disable it if you want. Go to Configuration -> Software -> Advanced Settings (this applies to all VMs on the host). After changing this setting you’ll need to vMotion your VMs off and back onto the host for the memory to be reallocated into small pages. NOTE: The impact on TPS only comes into play if you’ve enabled large pages in BOTH ESX and the guest OS. If it’s only enabled in ESX but the guest OS doesn’t request large pages, small pages will still be used and TPS will kick in as usual. Consider what applications are running and whether they benefit from large pages – otherwise it’s all a waste of time! Nice article! Thanks for referring to my blogpost about using large pages with SQL Server 2008.